The first official census in Britain took place in 1801, when the number of people living in Sutton Coldfield was found to be 2,847. Earlier estimates of the population are less reliable, although a census of Sutton taken by the Rector in 1771 was very thorough - he counted 2,587 people living in 485 houses with an average life expectancy of fifty years. This conflicts with his own previous estimate of the population in 1762 at 1,800, which must be too low. There is a rule of thumb sometimes used which states that the population in 1700 of most places in England was half that of 1801, giving a figure of just under 1,500 in the year 1700, which may also be too low. The Rector’s 1771 census showed that the population was over five times the number of houses. It is known from the Hearth Tax records that there were 311 houses in Sutton in 1674, so assuming the same ratio of population to houses the population must have been about 1,,600 then (the figure of 1,200, used in The Quarters of Sutton and Scenes from Sutton’s Past was based on a ratio of four people per household). However, the 1663 hearth tax records only 281 houses, so a good estimate for the population in the 1630s is about 1,400. The number of burials recorded in the Sutton Parish Register for the years 1635-9 is 131, giving and average yearly figure of 26; the national rate of deaths per thousand for England for this period is 28. These figures enable us to determine the average life expectancy at birth for England as 36 years (1000 divided by 28), whereas the Suttonians could expect to live 54 years (1400/26). Even supposing the parish register may have under-recorded the deaths and the estimated population of 1,400 may be too high, the figures bear out Sutton’s reputation as a healthy place to live. Infant mortality was high, one third of the burials being of a child. More population statistics can be gleaned from the marriage and baptismal registers. In 1638 there were nine marriages, and in those cases where it can be determined, the age at marriage for women averaged 26, while the men were aged thirty - these figures are close to the estimated national averages for age at marriage in the seventeenth century. Eleven of those being married were not born in Sutton, three of these being men who were marrying Sutton girls, reflecting a custom of the man leaving home to live in his wife’s parish. There are no accounts of what celebrations took place at Sutton, but no doubt the wedding feast was as enjoyable as the Dutch one illustrated here. 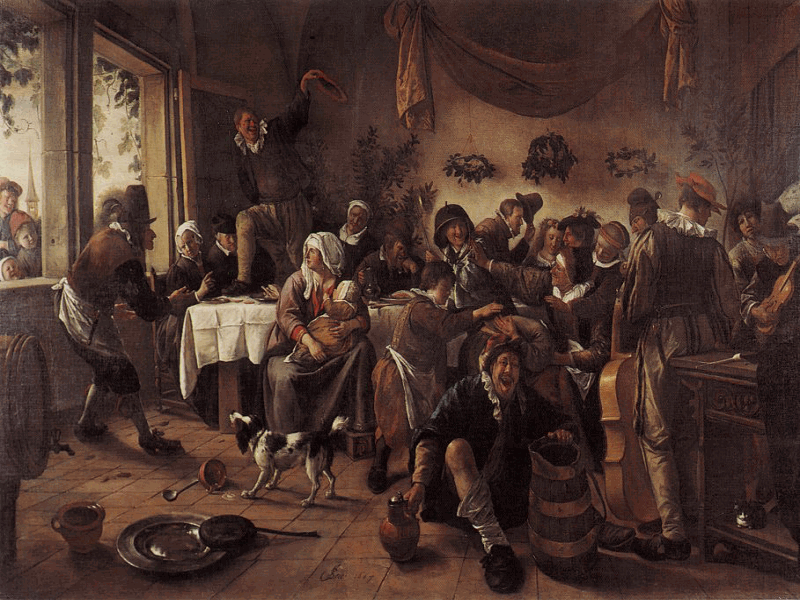 A wedding feast painted by Jan Steen, 1668.